Poetry for Cats is a special literary project to help cats in need by featuring poetry written for and about our furry feline friends. Running an animal rescue is an expensive operation that takes time, energy, and money to ensure that these animals get the medical and social attention that they need. Great Lakes Bengal Rescue (GLBR), a non-profit organization, recently rescued 12 more bengals from the owner of a mill who was no longer able to provide shelter and care for her cats. This is just one of many incidents in which GLBR rescues a large numbers of animals at once. However, they also take in cats that are given to them from loving families who can no longer care for their pets, from other shelters, and from seizures. 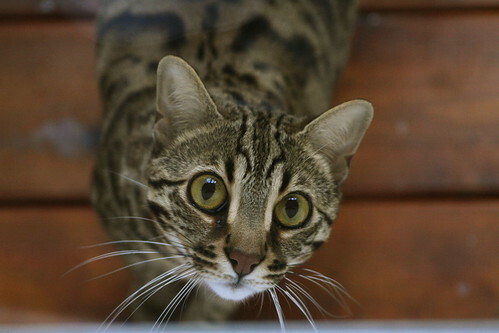 They cover 8 states and have over two dozen foster homes who work with the rescued bengal cats, providing them with care and shelter, until a permanent home is found. Running a charity organization that is dependent upon donations and gifts is no easy task, especially when tough economic times make it difficult for people to make ends meet. However, Janet Saltzman, President of GLBR, continues to move forward, rescuing cats in need and giving them the care they deserve. In honor of this lovely and noble breed of cats as well as in deep appreciation for all of the good work done by the Great Lakes Bengal Resucue, UNDERWORDs has collected a very special kind of donation from some very talented animal lovers. We give you Poetry for Cats. The poets participating in Poetry for Cats contributed their peoms as their special way of supporting GLBR. This post would not have been possible without their talent and generosity. Please enjoy the poetry, smile at the bengal photos, and consider giving a gift that will help GLBR to continue helping cats in need. Gifts made to GLBR are tax deductable. 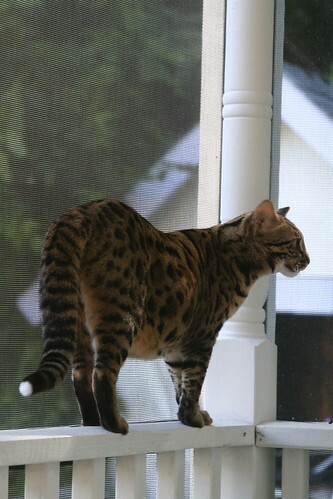 Donate to the Great Lakes Bengal Rescue. And for that I’m so very glad. And she does it with so much style. The one with the big green eyes. of all the dangers and delights untasted. you are there with me. we can only hold the door. your eyes lit against the darkness. Cat paws in the snow. with watchful eyes and pricked ears. Tales fill her up like cream. the ballads of blue jays. She is a huntress of story. If she scratches, do not be afraid. she knows you especially must remember. the simple stories for us. She hopes we will understand. she will give us her spinning worlds. Do they know their purrs affect us? all mischief and razor paws. moonbeams dull in dinnerdish eyes. in the afternoon. She cries. Mornings, Edith takes the shift. as you set down your pen and sip a drink. at the birds in the street. — to a point, if there’s no fish involved. and purr you into oblivion. in majesty. Oh scratching post!Oh acme of décor! this totem, tall and pure! tuxedo shorthairs under a parked truck. flowing like water poured on slate. in a way the man would never be. sleeps, keeper of a guiltless nonchalance. as I try to guess her very need. the joy of the feed. even as she deplores them. her old bones rule our home. In a cage with a rat. She looks like a bat. It’s six A.M. and you are still in bed. My paw is in your face. Relief! You growl! Your head, your middle, and we’ll steal …? We’ll tell you where to find your other moc. When we know how, then you can sleep ’til nine. This entry was posted in Make a Difference, Poetry, Uncategorized and tagged Bengal, Cat, Cat breed, Children's Hour, Foster care, Henry Wadsworth Longfellow, Humor, Leopard Cat, Pet, Pets, Purr, Recreation. Bookmark the permalink. 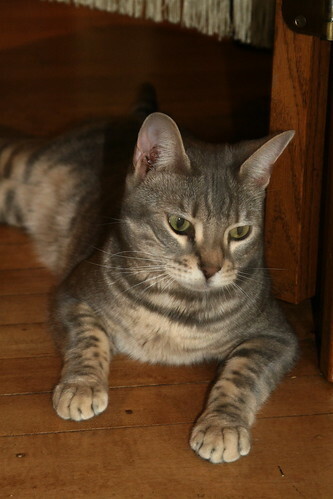 (By the way the Grey Ghosts are bundle of cuteness but not Bengals that I would know of – although, who knows? 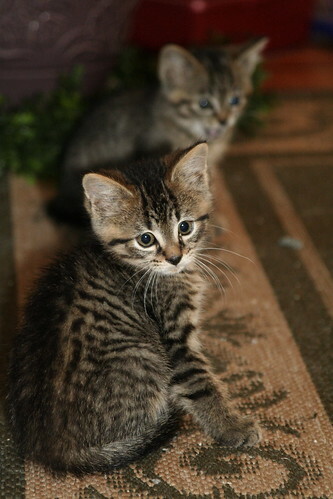 Their mom did not say – just strays Lorraine had fostered during my last visit there). Thanks, Nathalie. The poets and the photographer really did all of the important lifting. 🙂 So, thank YOU for those photos. They are lovely. “Poetry for Cats,” most excellent! Thank you! 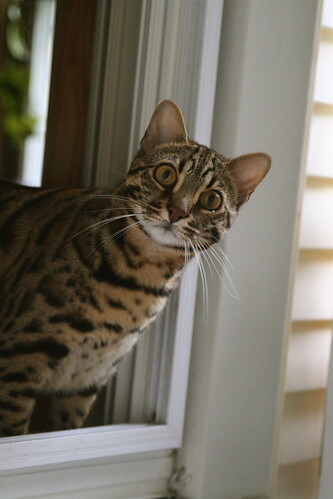 The fourth picture down is my own Bengal cat, Captain Jack Sparrow. 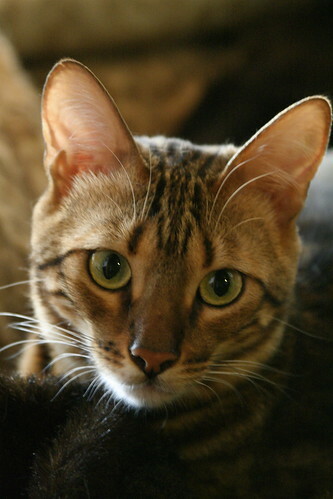 He was adopted from Great Lakes Bengal Rescue and he is a total gem, love, cuddle junkie, I could go on…. I was told that Bengals are typically not lap cats. Apparently, either no one told Captain Jack Sparrow this, or he never read the book. My lap is one of his favorite places to be. Go figger…. Currently, I have a roommate. As soon as he moves out, (which, now that he’s working, will be sooner rather than later,) my plan is to make my guest bedroom into a foster home for Great Lakes Bengal Rescue. Daryl, Captain Jack Sparrow caught my eye immediately when I was looking for photos to add. He’s beautiful. 🙂 I’m very happy that he found a good and loving home. There is some very fine work on Poetry for Cats for a very fine rescue group. These words come to me like the voices of many loves past and present. Thanks for all you do. Hi Maryll, I’m so glad you enjoyed the post. These poets and those cats really warmed my heart. Today I stumbled upon your lovely website & am delighted by the intention and the art. My intention was to search for appropriate poetry to send to 2 cats that I was caring for while their guardians were away travelling in EU. I have found something nice (chose “And the Cats”) & I am also inspired to take a stab at writing poetry (something that I never learned in school). They come in black, gray, orange and white. Throw them some catnip and watch them play. They’re seldom wrong and always right. And always love to have the last word! We’re very proud and a trifle vain. As you stroke their silky downy fur. Then pretend to sleep – or just smile and stare! Especially one who dares enter your house! Any cat will be happy if he lives with YOU! Im no pro, but I think you just crafted a very good point point. You cetrainly know what youre talking about, and I can really get behind that. Thanks for being so upfront and so sincere.